Could be true - right there on the cover of the CD - my favorite meter staring at me.... 13-8!!!! 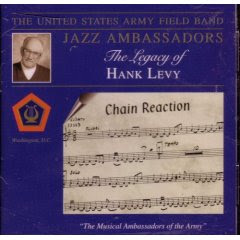 A corner of the flugelhorn sheet music to "Chain Reaction" performed by The United States Army Field Band Jazz Ambassadors - Legacy of Hank Levy - starting in 13/8 (33223) right in front of me. It was as if it were speaking to the very core of my being and it said, "Wake up sister you are not the only one". Haaah! Well, well, have your own ears decide, but this is one of the coolest arrangements I think I have ever heard in this style (full jazz band). Yes I might be a bit biased, to the 13 ya know. But, it contains lots of cool parts and instrumentation and I think it goes into 10/8 in one part and visits other meters too and some unexpected riffs that almost sound a little Opeth-ish. Chain Reaction will be on the next playlist, which is going to happen when I get my new new computer, hopefully this week. But in the meantime, the current list is stuck in a loop and apologies for that, it can get old fast. And in my meantime, I am going to be stuck on this Hank Levy loop. Yeah, you may or may not believe this, but my trumpet teacher was the one who played that flugelhorn solo on the recording. His name is Greg Reese, and he was with the Jazz Ambassadors for a pretty long time. He lives about five minutes from my house. The 13/8 stuff is definitely awesome, I'm seeing if we can get this for our jazz band. I think that the section you were talking about it being in 10/8, it's actually still in 13. Entire thing is, but that section that sounds like it's in 10 is in thirteen with the 33223 pattern, but the melody starts on the first 2. So it's like rest22123 play212123. It's pretty cool.